Yesterday was another good and busy day (are you tired of me mentioning how busy I am yet? I should wait until September so I can see what busy really means, right?) 😉 Thank goodness I’m organized! Anyways, when I arrived home from the office I saw a brown box at the front door and my heart fluttered with excitement. MAIL! 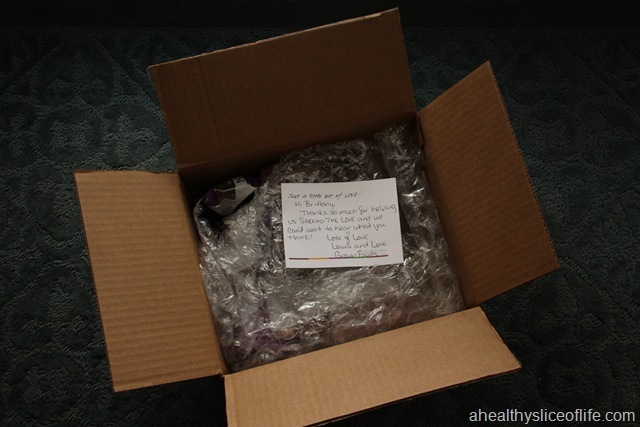 Now, with Hubbs’ job, he gets a lot of packages delivered to the house, but this one looked different. I ran up for a closer look, saw MY name on the address label and a new brand that I’ve been hearing so much about on the outside. Love Grown! EEE! I squealed out loud and made Koda turn her head, perk up her ears and look at me with that huh? puppy dog face. Ripping it open I discovered a sweet, handwritten note from Laura, which I thought was a truly lovely touch. 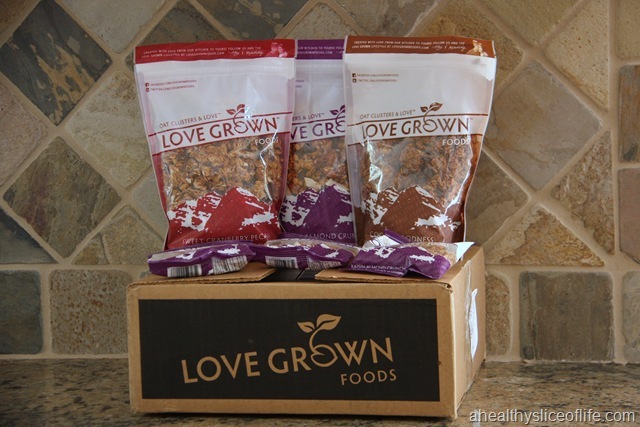 If you haven’t heard of Love Grown Granola, check out their website, and let me fill you in. Owners Maddy and Alex met in college and it didn’t take long to combine their love of healthy eating and natural entrepreneurship into what is now Love Grown Foods. Their ingredient list is all recognizable, nutritious and simple- which I absolutely love. I was pumped to finally try the delicious flavor I had heard so much about, and decided breakfast would be the perfect opportunity. but breakfast brought some sunshine into my life! I whipped up a breakfast parfait with some defrosted organic berries, Chobani 2% mango Greek yogurt, and Love Grown’s Raisin Almond Crunch Granola. Beautiful, isn’t it? But more importantly, the taste was frickin’ amazing. I pulled out a few of the larger granola pieces to try on their own and WOAH was I impressed. I first noticed the perfect texture of crunch. Not the –ouch I think I just broke a tooth– kind of crunch, but a natural, hearty –mmm– kind of crunch. The taste is incredible. I loved being able to to taste the real ingredients, not a sugar coating (because there isn’t one!). 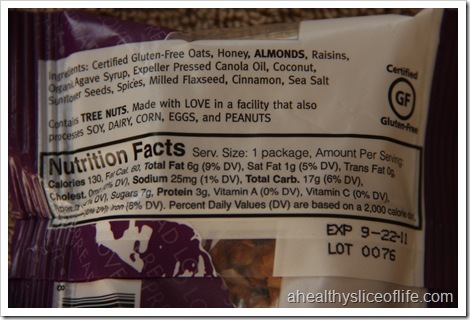 I savored the juicy raisins, crunchy almonds and the natural sweetness of honey and agave. I loved, seriously LOVED, that it wasn’t overly sweet. Just perfect. But don’t take my word for it- try it yourself! I’m going to send one of you a large bag of their Raisin Almond Crunch Granola to try out, along with this… look familiar? I picked a winner, but after a week of no response from them, I’m picking a new one! To enter to win a chance to win this fabulous Anthropologie-esque apron and a big bag of Love Grown Raisin Almond Crunch granola, simply leave a comment telling me your favorite way to eat granola. Yu can like me on facebook or follow me on twitter (@AHealthySlice) if you want, too, but it’s not necessary. I like granola on sugar free vanilla pudding. It’s my way to incorporate granola into desserts! Great giveaway! I love my granola flooded with milk with a big spoon! Yum! I hope I get to try this soon! 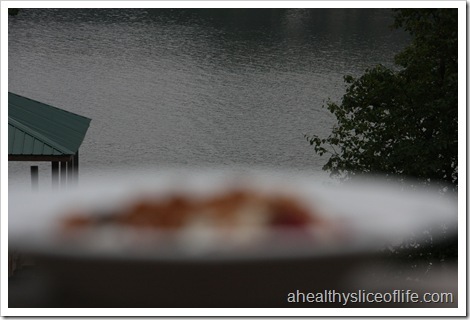 I’ve been wanting to get my hands on this granola that has taken the blog world over by storm! I like using granola as a topping on my oatmeal – simple but yummy! Have a great day! I love granola on my oatmeal! I have heard such great things about that granola but I haven’t had a chance to try it! My favorite way to eat granola — in a big bowl with almond milk! 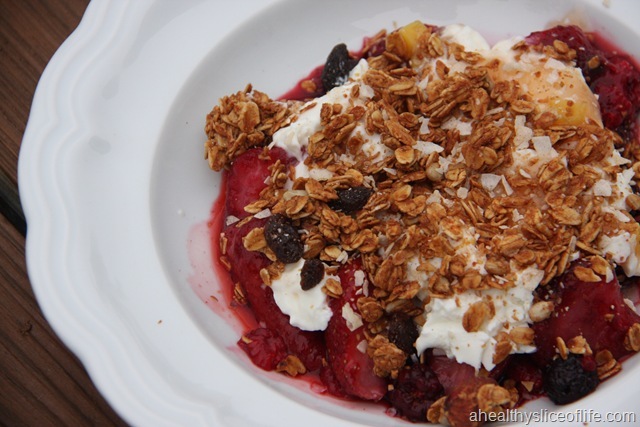 My Favorite way to eat granola is in yogurt! I’ve recently just started eating granola (i know- why am i just now jumping on this bandwagon). But i love it in fat-free plain yogurt with fruit – right now my pick is strawberries. Oh, yum! 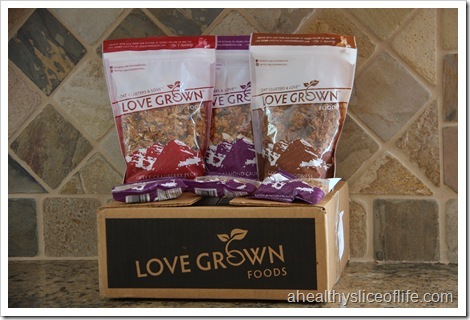 I have really been wanting to try some Love Grown Granola! I love to make monster parfaits- yogurt, berries, granola, and a little nut butter. My favourite way to eat granola is with greek yogurt and a tiny splash of milk… so creamy! I’m in the UK so I’m not sure whether I can enter this? Either way- you should try the yougurt & splash of milk combo… to die for! Ooooh, I have been wanting to try Love Grown! I actually really like to eat granola in a bowl with milk, like cereal, but also love it sprinkled on yogurt with fruit. 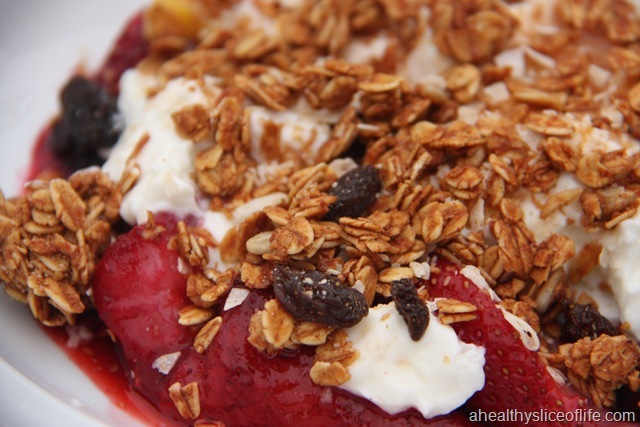 I love granola with greek yogurt and fruit, yum!! Mmm, I absolutely love granola. I like it on my yogurt, but also use it as a cereal ‘treat’ every once in a while! Love Grown looks fantastic! i mix it with yogurt and then scoop the mixture up with graham crackers! I mix some granola into a Chobani Champion (yes I eat the kid’s kind:)) almost every night for a snack. I am loving your blog!!! I love my granola on top of some greek yogurt! Granola: by the handful, sprinkled on yogurt, ice cream, topped on cobbler, salad, and it’d be even sweeter while wearing that cute apron!! I love my granola on top of some yummy yogurt! 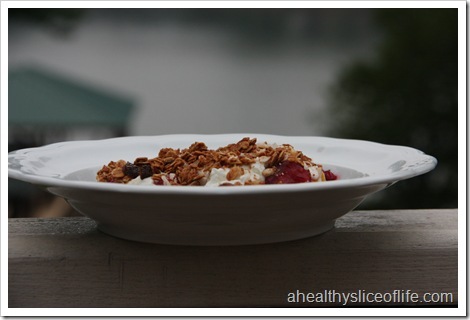 My favorite way to eat granola is with yogurt or on top of apple or peach crisp. Very cute apron! Granola with Greek yogurt and berries is my fav! Yaaay for giveaways, Brittany! 🙂 I think I just like it best in small portions with some low fat milk. But I do eat it on oatmeal, in smoothies like I had this a.m., and mixed with yogurt as well. I love granola on whole milk, organic greek yogurt. Mmm… it’s my favorite especially in the summer when it gets warm out. I am so excited! 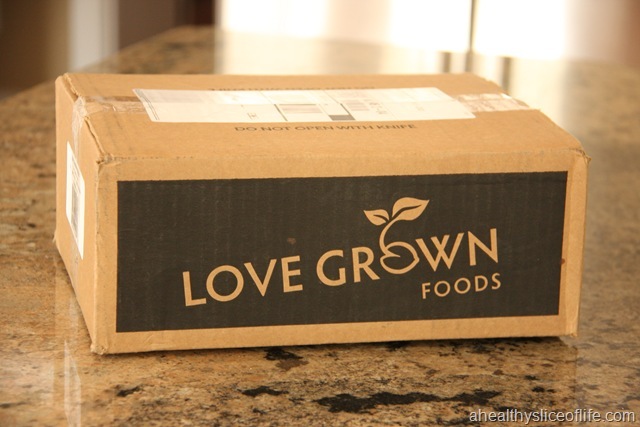 I am new to Granola and have been wanting to try Love Growns brand. But, my favorite way to eat granola right now is on top of yogurt. Great giveaway! My fav way to eat granola is to mix it in with 2tbsp of almond butter. Soooo yum! I love a big bowl of fruit and yogurt sprinkled with a granola! So delish in the summer 🙂 Yours looked amazing Brittany, I’m totally craving now! What a cute apron! I inherited an obsession for aprons from my mom. My favorite way to eat granola is straight up out of the bag. 😉 I still have yet to try Love Grown! I love granola with yogurt! My favorite way to eat granola is with cottage cheese! 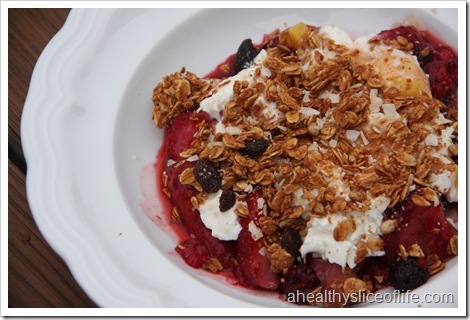 granola with yogurt and chopped up fruit is my favorite! I like my granola on yogurt as well!! I like gf granola w/ plain yogurt and fresh fruit (either strawberries, blueberries, or blackberries). Yummy! Love that this brand is gf. It’s hard to find a good gf granola. No-sugar, authentic granola is hard to find! This granola looks great, can’t wait to try it! I love having granola with greek yogurt and berries. Maybe some mangoes would go along well too! Thanks for sharing. I’d love to try this! My favorite way to eat granola? On FroYo!! 🙂 I also love it on yogurt. That apron is adorable! I LOVE THAT APRON AND I WANT ITTT! 🙂 I’m following you! Ohmygosh that apron is ADORABLE!!!!! And I can always use some delish granola on my chobani yogurt in the morning! yum! That stuff is even amazing on ice cream! <3 addicted! My favorite way to enjoy granola is on top of my oatmeal! YUM! Love it when food is food, pure and simple. My favorite way to eat granola is sprinkled on my honey Greek yogurt. 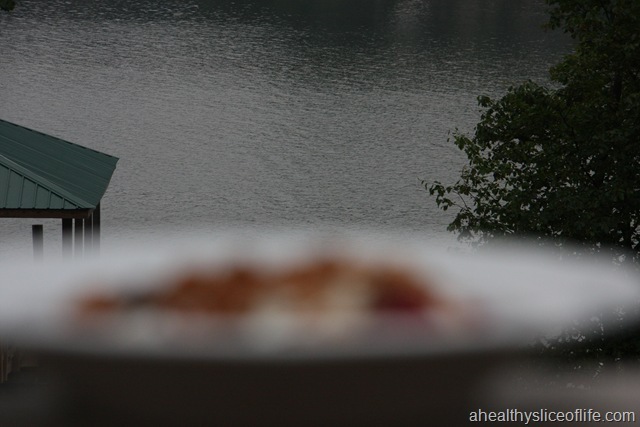 I’m with you–love the granola on yogurt! But if I win, you can keep that apron for yourself! I have two, and we’ve already seen how adorable it looks on you! 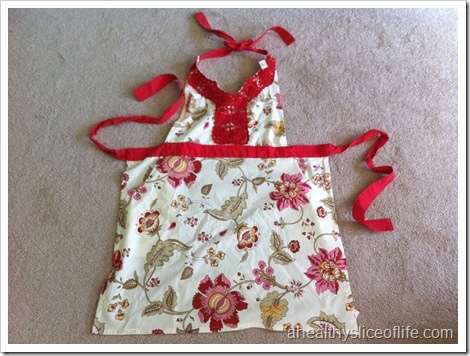 Britt– the apron is adorable and the granola sounds delish. Most importantly, I love hearing how you are doing! That apron is super cute! 🙂 Granola is in my breakfast every single morning with some sort of fruit and vanilla greek yogurt. I only get organic as well, because some granola is just too sweet. 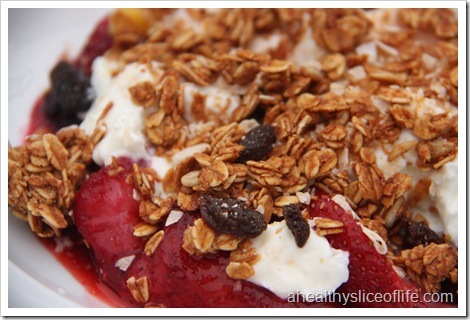 I LOVE granola atop steel cut oats, greek yogurt, and mixed berries! Is that a lake or ocean in your picture?? It’s so beautiful. I love granola with yogurt and strawberries! I LOVE to eat granola by the handful and on greek yogurt! YUM! Love putting granola on my yogurt and in my ice cream! A food parcel (especially a GOOD one) would brighten my cloudy day too. Enjoy!!! Have a good weekend too. My fav way to eat granola would be with raspberry Greek yogurt, topped with fresh organic berries and wearing that adorable apron! Xxo Brittany. Thanks for recommending these awesome things that I don’t have time to research for myself. I just heard that, in a study, women who include Greek yogurt and other high protein & calcium foods in their diet will lose 81% more belly fat than those who don’t. SO, my favorite way to eat that Love Grown Granola would be with Raspberry Greek Yogurt, topped with fresh, organic berries, and wearing that adorable apron! =) Thanks for sharing all these awesome foods and recipes that I don’t have time to research for myself..AND in such an amusing way. 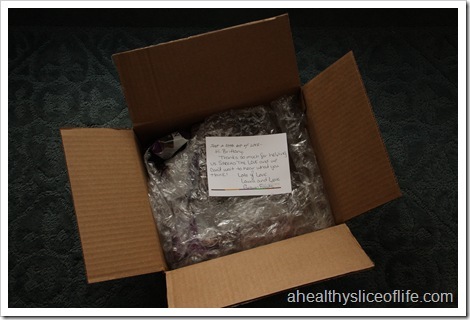 I <3 ahealthysliceoflife!!! I really want to try this granola! I like mine with greek yogurt! I looove Love Grown Foods! So crunchy and delicious! 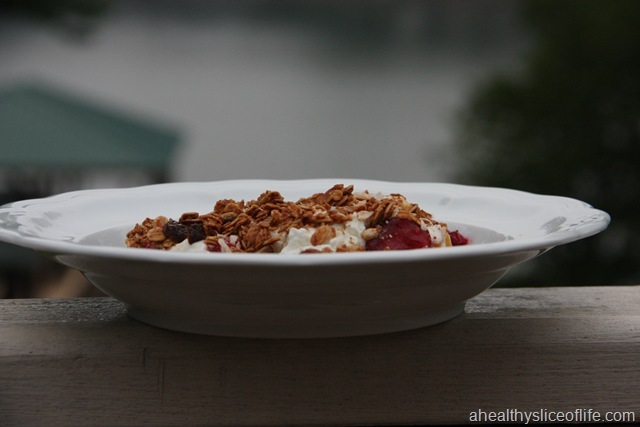 My favorite way to eat granola is in a bowl with milk – classic! 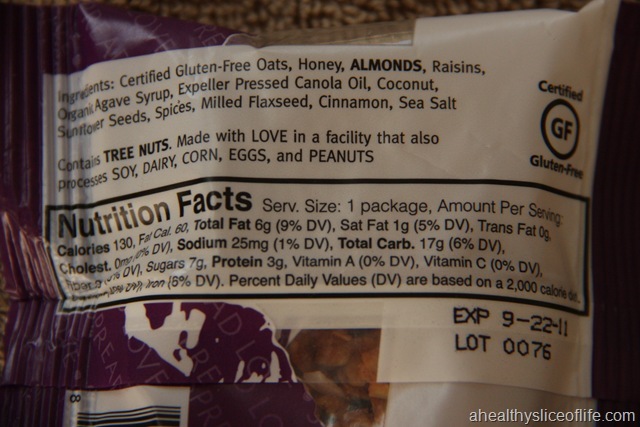 I’ve never tried Love Grown before but I put other granolas on my oats or my yogurt. And that apron is so cute! 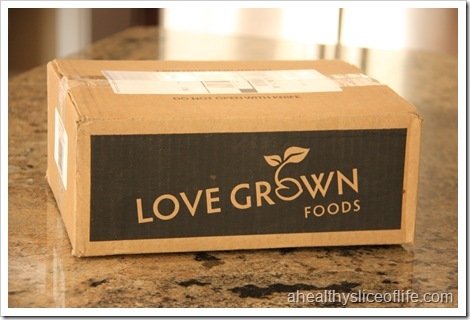 I would love the opportunity to try Love Grown granola! I’ve seen it everywhere, and have heard nothing but super positive reviews! I love my granola on top of whipped sweetened cottage cheese drizzled with peanut butter. It’s SO good, and makes a perfect nighttime treat! I love my granola with just some vanilla almond milk and chia seeds sprinkled on top….just simple and perfect! OH I love getting FREE delicious food samples in the mail! I’m not a huge granola fan, other than my own (because I can’t eat many of the things they put in granola) so I won’t enter your giveaway. But thanks for the opportunity! Also, I love that apron. It’s adorable. I like my granola mixed into vanilla Greek yogurt. I always mix granola in my Chobani Vanilla yogurt and top with blueberries…YUM!!!!! I love to eat granola mixed into my yogurt!